IBA CEIF is pleased to offer an advanced level course on the role of Policy Framework in the success of Islamic Finance Industry. The objective of the course is present to the participants the relevant tools, guidelines and approaches for Islamic Finance industry's mainstreaming into the financial sector. 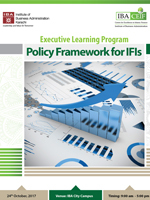 The course is designed to give Policy makers, Planners and Chief Executives an overview of successes and failures of IFIs in various jurisdictions drawing comparisons in Policy frameworks as they were developed and implemented. An experienced foreign trainer will ride the attendees through case studies and practical examples. Mohammad Farrukh Raza is the Founder & Managing Director of IFAAS, UK. Farrukh brings on board exceptionally rich experience across various sectors of the Islamic finance industry where he has led many pioneering Islamic Finance projects in Europe, Central America, GCC and Africa. Farrukh's experience includes advising the key stakeholders and regulatory authorities on developing the regulatory, legal and tax frameworks for implementing Islamic Finance in several markets. He has also led many market research projects and feasibility studies to launch new Islamic financial operations. Previously he has held senior roles at Islamic Bank of Britain, the first Islamic bank in Europe and also played a key role in rolling out the first Takaful company in Europe. Farrukh holds an MBA in Strategic Management and is a member of the Chartered Institute of Marketing (UK). He is also a member of the UKIFS, Islamic Finance Experts Group (UK), Islamic Finance Commission at Paris Europlace (France), Business & Economics Committee of Muslim Council of Britain (UK) and Mosaic Network of The Prince's Trust (UK). Farrukh is an influential industry speaker at international conferences and frequently lectures at reputed universities worldwide.